Hello. 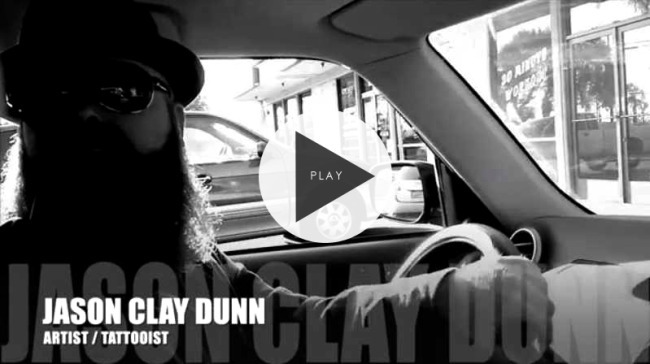 I'm Jason Clay Dunn. I was born in Albuquerque, New Mexico. I currently reside in the Inland Empire, Rancho Cucamonga to be exact. From a very young age I've always had a need to create. Whether it be a piece of art, or a business, I have found that the combination of both is what really inspires my passion for art and tattooing. I have always been (and still am) truly amazed by seeing colors beneath the skin. It never gets old to me. Art has been a journey in my life. Along the way, I have developed many skills in airbrush, digital graphics, and the fine arts, but I believe it’s the one-on-one aspect, and the challenge and difficulty of tattooing, along with the smell of fresh paint and canvas that overall has held my interest to this day. This is my personal web site. Here I'll share random moments and thoughts via photos, video posts, and writings about things from my day-to-day life. I'll also share my various works of art here, which are also availible in the JCD STORE for purchase. This site is dedicated to all of my tattoo work and related subjects. Such as the progress of tattoos, videos of tattoo creations, up-coming conventions and traveling as well as my updated portfolio. This is my studio's website. Here you can learn about the team of artists I work with and see photos of our beautiful studio here in Montclair, California. We also have a section of Frequently Asked Questions where you can read and learn about the studio and the tattoo process, along with other general information. We also have a store available where you can show your Tattoo Alchemy pride and pick-up some tee shirts and other merch. • I started tattooing in 1993. • I used to sing in a band. • I play the drums. • A tattoo I did on Actress Nona Gaye appears in the second Matrix movie. • Favorite cigar... VSG Ashton. • I have an extensive hat & briar pipe collection. • I am afraid of heights. • I once shot a hole-in-one... then it bounced out. • Coke vs. Pepsi? Coke. • I used to be part of a breakdance crew. 'Mechanical Kid' in da hizzy. • The first tattoo I ever did was a Dumbo tattoo on an X-girlfriend. • If I had to pick one...my favorite band is Radiohead. • I’ve traveled across the United States by train. • My first job was selling blowpops on the school bus. • The only time I ever bet on a horse, I won. • Shi Shi Foo Dogs are what started my fascination with oriental artwork. • I used to own a hairless cat named Billy. (The actual son of Mr. Biglesworth). • I have a dog named Biscuit and a cat named Pan. For More... Watch The Video (above).